Mineral trioxide aggregate (MTA) is based on ordinary Portland cement (with added radiopaque agents) and, thus, shares many of its features. Although MTA is reported to be difficult to handle clinically, concrete materials made using Portland cement are the foundation of the construction industry. In this paper, we summarize important lessons from the construction literature that are relevant to the successful use of MTA in clinical practice, including behaviour during storage, susceptibility to acidic environments, the effects of exposure of the setting material to moisture and interactions with substances that may interfere with the speed of setting and the quality of the end product. Although case reports and clinical trials guide clinicians on where MTA can be used, they do not provide practical information on the rationale for the individual steps taken to manipulate the material and how these affect clinical success. Because MTA is primarily OPC, it is insightful to assess literature related to the use of OPC in the construction industry to identify key factors that relate to performance and draw parallels between them and clinical practice. The clinical issues discussed below are, therefore, intended to complement manufacturers' directions for use. In the construction industry, OPC is commonly combined with sand or gravel and water to produce concrete. The sand or gravel filler, which is termed aggregate, provides additional strength to the final set product, making it better suited to situations where heavy loads will be applied, such as in buildings, roads and bridges. During setting, OPC reacts with water to form calcium silicate/aluminate hydrates (such as (CaO)3· (Al2O3)·6H2O and (CaO)3(SiO2)2·4H2O), calcium hydroxide and water. The final set cement is a crystalline structure with voids containing water and calcium hydroxide. Despite appearances, the set material is not fully solid; rather there is an associated fluid state, much like water held within in a wet sponge. During the setting reaction, needle-like crystalline hydrates form a framework connecting all the particles together and, effectively, turning the original powder–liquid mixture into a solid-like colloidal gel. If water is lost to the atmosphere during the setting reaction, this will significantly weaken the set material. Hence, loss of moisture while MTA is setting must be avoided. When set cement is exposed to acids, the saturation of its contained fluids with calcium hydroxide is lost, as hydroxide ions are consumed in acid–base reactions. This leads to loss of some of the hydrate structure, creating a surface etching effect. A single treatment with hydrochloric acid can be used both to clean and etch concrete, exposing the aggregate as well as the matrix. Any other exposure of concrete to acidic environments is avoided. In the construction industry, acidic water is never used in mixing concrete, because it will cause the formation of intermediate compounds that retard hydration of the cement and limit the production of calcium hydroxide.4,5 Furthermore, acids will decompose both calcium silicate hydrate structures and calcium hydroxide. In the presence of acids, the compounds that form during setting are likely to be more soluble; this disrupts the formation of the mesh of interlocking crystals and also causes them to leach out of the set material.6 Before concrete is poured onto acidic soil, a process known as chemical stabilization or soil conditioning is performed.7 The soil is mixed with an alkaline material (such as calcium oxide or calcium hydroxide) and allowed to reach a neutral pH before placement of cement. It has been suggested that pretreatment with calcium hydroxide paste may adversely affect the sealing ability of MTA, as it may be difficult to remove and, thus, remnants might act as a barrier to the adaptation of MTA to the root canal walls or become involved in the MTA setting reaction.15 The latter point is at odds with the literature from the construction industry, which advocates the use of calcium hydroxide to condition acidic soil. However, calcium hydroxide dressings used in dentistry may contain various additives, such as methylcellulose and carboxymethylcellulose, which are known to retard the setting of OPC.16,17 Therefore, if a dressing of calcium hydroxide paste is used, extensive irrigation should be carried out to ensure that no remaining dressing material is present, as remnants of the cellulose thickener will retard the setting of MTA. Although MTA is often described or marketed as being able to set in a wet and possibly bloody environment, it is important to minimize the ingress of any tissue fluids or blood into MTA during placement or as it is setting. This is particularly important along the margins of the preparation where leakage would occur if the MTA sets with inferior properties. Clinicians should minimize hemorrhagic contamination, as excessive blood will not only impair vision and access but will also affect the setting reaction and the quality of the end product. The reaction of OPC with water is dynamic, and water must be retained within the cement during curing to maintain the structure and ensure strength of the final product. If water is lost to evaporation, the strength of the set cement will be reduced. In the construction industry, a range of methods are used to minimize water loss during curing, including wet curing (e.g., sprinkling water on the cement to replace water that has evaporated) and membrane curing (e.g., covering the cement with a water-tight membrane to prevent evaporation). Following the industry approach of membrane curing, a material, such as GIC or resin-modified GIC liner, can be placed over the MTA. Once this has been placed, the MTA is stable in terms of water loss or gain from the surface, and the clinician can proceed to restore the tooth or obturate the canal. This concept has been tested with white ProRoot MTA (Dentsply, Johnson City, USA), which has an initial setting time of 45 minutes. GIC placed over the MTA after 45 minutes gives a shear bond strength to dentin which is the same as that seen for any more than waiting 72 hours to place the GIC once the MTA has set completely.26 Therefore, there appears to be no advantage in leaving MTA to set over a period of a few days compared to a one-visit restoration. However, there do not appear to be any adequate studies that assess the implications of waiting less than 45 minutes before placing GIC onto MTA. This analysis of certain aspects of industrial concrete provides insight into and sound principles for the clinical manipulation of MTA. The practical points from this discussion are summarized in Table 1. Infected (acidic) radicular structures Neutralize with Ca(OH)2 paste and/or NaOCl irrigation, for example. Restoration in esthetic zone Consider other materials and procedural alternatives; e.g., Ca(OH)2 Cvek pulpotomy in traumatized exposures. Endodontic medicaments present in canal Remove with NaOCl or saline irrigation. Etchant, conditioners and chelating irrigants Neutralize with NaOCl irrigation. Hemorrhage into prepared cavity Minimize hemorrhage. Use of local anaesthetic, chlorhexidine or saline water to mix MTA Use distilled water. GIC/RMGIC liner, but allow MTA to set for 45 minutes before application. Self-etching bonding agent, but allow MTA to set for 10 minutes before application. Storage of MTA Do not refrigerate. Once opened, place material to be re-used in an airtight container. RMGIC = resin-modified glass ionomer cement. Dr. Ha is a PhD student, University of Queensland, School of Dentistry, Brisbane, Australia. Dr. Kahler is a senior lecturer, University of Queensland, School of Dentistry, Brisbane, Australia. Prof. Walsh is a professor, University of Queensland, School of Dentistry, Brisbane, Australia. Acknowledgements: This work was supported in part by the Australian Dental Research Foundation. Foley JI. 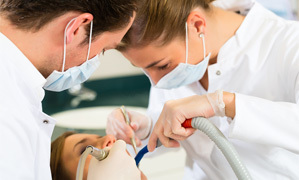 Use of mineral trioxide aggregate (MTA) by postgraduates in restorative dentistry in the UK. Eur J Prosthodont Restor Dent. 2011;19:179-83. Pitt Ford T, Mannocci F, Woolford M. Survey on the teaching and use of mineral trioxide aggregate in UK dental schools. Eur J Dent Educ. 2007;11:155-9. Ridi F, Fratini E, Baglioni P. Cement: a two thousand year old nano-colloid. J Colloid Interface Sci. 2011;357:255-64. Rai S, Chaturvedi S, Singh N. Examination of Portland cement paste hydrated in the presence of malic acid. Cement Concr Res. 2004;34:455-62. Möschner G, Lothenbach B, Figi R, Kretzschmar R. Influence of citric acid on the hydration of Portland cement. Cement Concr Res. 2009;39:275-282. Neville AM. Properties of concrete. 5th ed. London: Pearson Education Limited; 2011. Nekoofar MH, Namazikhah MS, Sheykhrezae MS, Mohammadi MM, Kazemi A, Aseeley Z, et al. pH of pus collected from periapical abscesses. Int Endod J. 2009;42:534-8. Saghiri MA, Lotfi M, Saghiri AM, Vosoughhosseini S, Fatemi A, Shiezadeh V, et al. Effect of pH on sealing ability of white mineral trioxide aggregate as a root-end filling material. J Endod. 2008;34:1226-9. Shokouhinejad N, Nekoofar MH, Iravani A, Kharrazifard MJ, Dummer PM. Effect of acidic environment on the push-out bond strength of mineral trioxide aggregate. J Endod. 2010;36:871-4. Lee YL, Lee BS, Lin FH, Yun Lin A, Lan WH, Lin CP. Effects of physiological environments on the hydration behavior of mineral trioxide aggregate. Biomaterials. 2004;25:787-93. Pace R, Giuliani V, Pini Prato L, Baccetti T, Pagavino G. Apical plug technique using mineral trioxide aggregate: results from a case series. Int Endod J. 2007;40:478-84. Giuliani V, Baccetti T, Pace R, Pagavino G. The use of MTA in teeth with necrotic pulps and open apices. Dent Traumatol. 2002;18:217-21. Tait CM, Ricketts DN, Higgins AJ. Weakened anterior roots — intraradicular rehabilitation. Br Dent J. 2005;198:609-17. Stefopoulos S, Tsatsas DV, Kerezoudis NP, Eliades G. Comparative in vitro study of the sealing efficiency of white vs grey ProRoot mineral trioxide aggregate formulas as apical barriers. Dent Traumatol. 2008;24:207-13. Cheung J, Jeknavorian A, Roberts L, Silva D. Impact of admixtures on the hydration kinetics of Portland cement. Cement Concr Res. 2011;41:1289-309. Peschard A, Govin A, Grosseau P, Guilhot B, Guyonnet R. Effect of polysaccharides on the hydration of cement paste at early ages. Cement Concr Res. 2004;34:2153-8. Zehnder M. Root canal irrigants. J Endod. 2006;32:389-98. Nicu M, Ionascu L, Turcanu C, Dragolici F, Rotarescu GH, Dogaru GH. The influence of the complexing agents on the concrete matrix studied by XRD. Rom J Phys. 2008;53:841–50. Smillie S, Glasser F. Reaction of EDTA, oxalic acid and citric acid with Portland cement. Adv Cement Res. 1999;11:97-101. Thomas NL, Double DD. The hydration of Portland cement, C3S and C2S in the presence of a calcium complexing admixture (EDTA). Cement Concr Res. 1983;13:391-400. Camilleri J. Color stability of white mineral trioxide aggregate in contact with hypochlorite solution. J Endod. 2014;40:436-40. Belobrov I, Parashos P. Treatment of tooth discoloration after the use of white mineral trioxide aggregate. J Endod. 2011;37:1017-20. Lee YL, Lin FH, Wang WH, Ritchie HH, Lan WH, Lin CP. Effects of EDTA on the hydration mechanism of mineral trioxide aggregate. J Dent Res. 2007;86:534-8. Parirokh M, Torabinejad M. Mineral trioxide aggregate: a comprehensive literature review — Part I: chemical, physical, and antibacterial properties. J Endod. 2010;36:16-27. Yesilyurt C, Yildirim T, Taşdemir T, Kusgoz A. Shear bond strength of conventional glass ionomer cements bound to mineral trioxide aggregate. J Endod. 2009;35:1381-3. Aggarwal V, Jain A, Kabi D. In vitro evaluation of effect of various endodontic solutions on selected physical properties of white mineral trioxide aggregate. Aust Endod J. 2011;37:61-4. Al-Harthy AS, Taha R, Abu-Ashour J, Al-Jabri K, Al-Oraimi S. Effect of water quality on the strength of flowable fill mixtures. Cement Concr Compos. 2005;27:33-9. Vanderweele RA, Schwartz SA, Beeson TJ. Effect of blood contamination on retention characteristics of MTA when mixed with different liquids. J Endod. 2006;32:421-4. Nekoofar MH, Stone DF, Dummer PM. The effect of blood contamination on the compressive strength and surface microstructure of mineral trioxide aggregate. Int Endod J. 2010;43:782-91. Nekoofar MH, Oloomi K, Sheykhrezae MS, Tabor R, Stone DF, Dummer PM. An evaluation of the effect of blood and human serum on the surface microhardness and surface microstructure of mineral trioxide aggregate. Int Endod J. 2010;43:849-58. Tingey MC, Bush P, Levine MS. Analysis of mineral trioxide aggregate surface when set in the presence of fetal bovine serum. J Endod. 2008;34:45-9. Kim Y, Kim S, Shin YS, Jung IY, Lee SJ. Failure of setting of mineral trioxide aggregate in the presence of fetal bovine serum and its prevention. J Endod. 2012;38:536-40. Ryan WG, Samarin A. Australian concrete technology. Melbourne: Longman Cheshire; 1992. Roberts HW, Toth JM, Berzins DW, Charlton DG. Mineral trioxide aggregate material use in endodontic treatment: a review of the literature. Dent Mater. 2008;24:149-64. Watts JD, Holt DM, Beeson TJ, Kirkpatrick TC, Rutledge RE. Effects of pH and mixing agents on the temporal setting of tooth-colored and gray mineral trioxide aggregate. J Endod. 2007;33:970-3. Kogan P, He J, Glickman GN, Watanabe I. The effects of various additives on setting properties of MTA. J Endod. 2006;32:569-72. Kao CT, Shie MY, Huang TH, Ding SJ. Properties of an accelerated mineral trioxide aggregate-like root-end filling material. J Endod. 2009;35:239-242. Vail MM, Steffel CL. Preference of temporary restorations and spacers: a survey of Diplomates of the American Board of Endodontists. J Endod. 2006;32:513-5. Tsujimoto M, Tsujimoto Y, Ookubo A, Shiraishi T, Watanabe I, Yamada S, et al. Timing for composite resin placement on mineral trioxide aggregate. J Endod. 2013;39:1167-70. Ha WN, Kahler B, Walsh LJ. Particle size changes in unsealed mineral trioxide aggregate powder. J Endod. 2014;40:423-6. Saghiri MA, Lotfi M, Joupari MD, Aeinehchi M, Saghiri AM. Effects of storage temperature on surface hardness, microstructure, and phase formation of white mineral trioxide aggregate. J Endod. 2010;36:1414-8. Saghiri MA, Asgar K, Lotfi M, Nazari A, Karamifar K, Neelakantan P, et al. Effect of storage temperature on sealing ability and solubility of white mineral trioxide aggregate. Acta Odontol Scand. 2012;70:536-40.